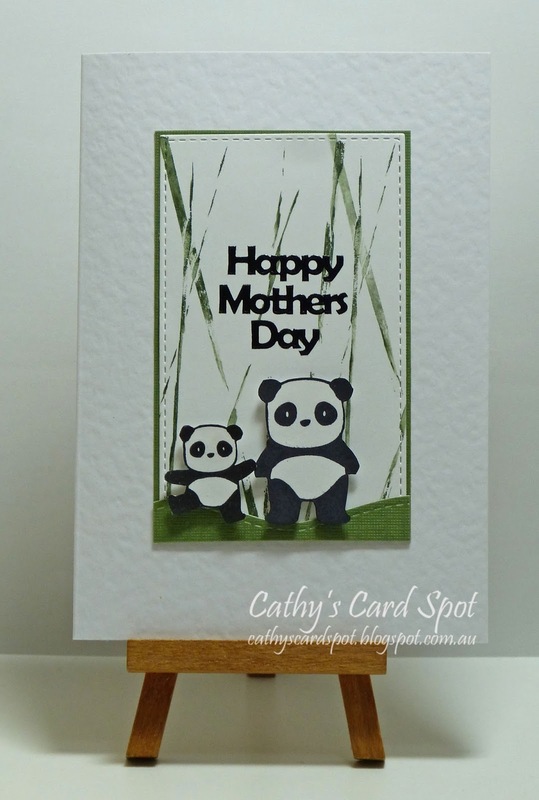 Cathy's Card Spot: Rubber band bamboo! Hi everyone, I'm racing to the finish line with this card! I wanted to join in the fun at CAS Mix Up Card Challenge, where they are stamping with rubber bands! There are some amazing entries and designs by the DT. I wrapped a few bands around an acrylic block ( don't have a brayer with a removable roller). I thought the lines looked a bit like bamboo and went with that! My other elements are stamping, fussy cutting and diecutting. The base is a hammer card and it has that great texture when you buy it. At Simon Says Work it Wednesday, it's a Mother's Day theme. 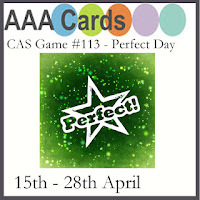 At AAA Cards it's all about the perfect day. Mother's Day is usually pretty perfect for me as I am happily spoilt so that I don't have to do any cooking, cleaning or housework, and if I want to stay in the craft room all day...I can lol! Mama Elephant panda stamp; black archival ink; versafine olympia green ink; Crafts 4 u stitched rectangle die; Happy Little Stampers stitched border die; sentiment sticker. Fabulous card Cathy, what a very clever idea l thought you had used a bamboo stamp till l read your post. Love the pandas. Wow, that is thinking outside the box. Great design and very clever to use rubber bands to make bamboo. Very cute card. The bamboo idea and fun rubber band technique works so well with those adorable Panda's. What an fabulous card and well done on adding your wonderful card just before it closed. Your rubber band stamping does look like bamboo, Cathy! A perfect pairing with the pandas! Thanks for sharing with us at CAS Mix Up! WOW, gorgeous. Love the rubber band bamboo so perfect. You are right, it looks like bamboo and is the perfect background for you adorable pandas! What a sweet card! Aren't you clever! Love the 'lakky' band bamboo and those Panda's are simply adorable. Great card stock - certainly adds that touch of texture. You rocked this challenge Cathy. Lucky you being so spoilt on mother’s day! Love the rubber band stamping and the cute pandas. The rubber band technique was a perfect background for your darling little pandas, Cathy. Thanks for sharing your card with us at Addicted to Stamps and More.